Create an HTML report in katalon studio is really handy. There are thousands of test cases in a large project and it is a big and hectic task to manage the report of all the test cases one by one. In the katalon studio, we can do the same task within a seconds. And Its really easy and you does not need any programming knowledge. Create an HTML report in katalon Studio. Step 1: Create Test Cases. Create multiple test cases For Example Tc1, Tc2, Tc3 etc. Step 2: Create Test Suites. We can create multiple Test Suites and add Test cases in Test Suites according to the requirement. 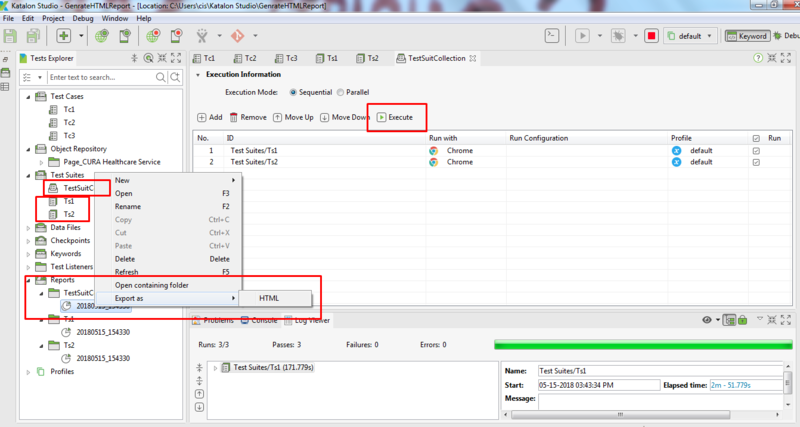 Step 3: Create Test Suites Collection. We can create multiple Test Suites collection or single also. Just create a test suit collection and add Test Suits. Step 4: Execute the Test Suite Collection. Step 6: Click on the Reports to view the report and then right Click on the report and export in a format like HTML, CSV, XML. And save it in your directory.